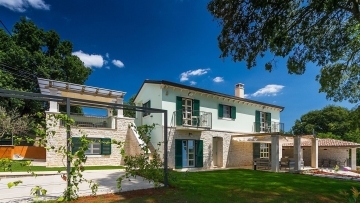 Beautiful house in a quiet environment nearby one of the most beautiful Istrian towns of Vrsar. On the ground floor there is a bedroom with a bathroom, kitchen and living room with a large fireplace, terrace overlooking the garden and a swimming pool of 24 sqm. On the ground floor there are 2 more bedrooms, each with its own bathroom. On the first floor there is a terrace with seating furniture. The house is fully equipped and furnished, it has a fireplace, air conditioning, SAT / TV and internet.